Historic Post Office building houses extensive displays of the copper smelting era 1861-1923. 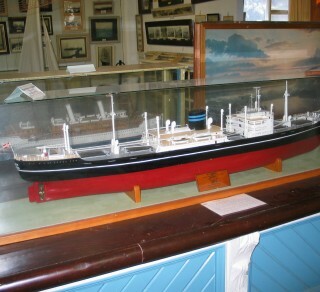 In a 1865 solid limestone building which was the town’s first post office, this National Trust run museum houses extensive displays of the copper smelting era which lasted from 1861-1923, postal & telephone history, religious and civic affairs, industry, sport, entertainment, extensive nautical, and general local history.In the large nautical complex in the grounds is one of the museum’s most popular and unusual exhibits ‘George the Giant Squid” , a deep ocean dwelling squid, obtained from the stomach of a whale in about 1980 and now preserved in formalin, its body is five feet (1.5 m) long and 28 feet (8.5 m) long with its tentacles outstretched. Also on display in this area is the magnificent 1910 Wallaroo Waterside Workers Federation banner, one of the most significant objects in the museum’s collection. There is also material relating to Miss Evelyn Marsden, the only surviving female passenger on the fateful Titanic which sank in 1912. She and her husband Dr William Abel James lived and worked in Wallaroo for a short period after this tragic event. 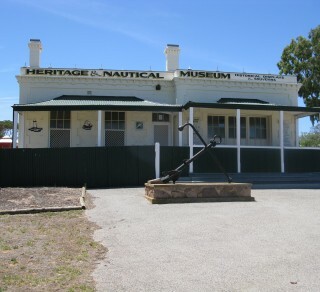 There is also a new building with a display of railway memorabilia which played an important part in Wallaroo’s history.The former 1877 Tipara Reef Lighthouse can be seen in Investigator Park in front of the museum. Come in and collect a map for a self drive heritage trail around Wallaroo. Trace your family ancestors if they lived in the Copper Coast Area. Book for the ghost walks and see where the ghosts live in Wallaroo. Monday to Sunday and Public Holidays 10.00am - 4.00 pm. Christmas Day, and extreme weather please contact museum.